Yes, I am a hotel snob. I spend months every year staying in hotels for business so in many different cities so I consider myself very picky in my hotel standards. I have stayed at glorious hotels and ones that make you want to take a bath after sleeping on the questionable linens. Just thinking about that makes me itch and want to scratch all over. Thank God I don’t travel with a blacklight—it would be a nightmare to discover what else is staying with me on hotel surfaces in China. 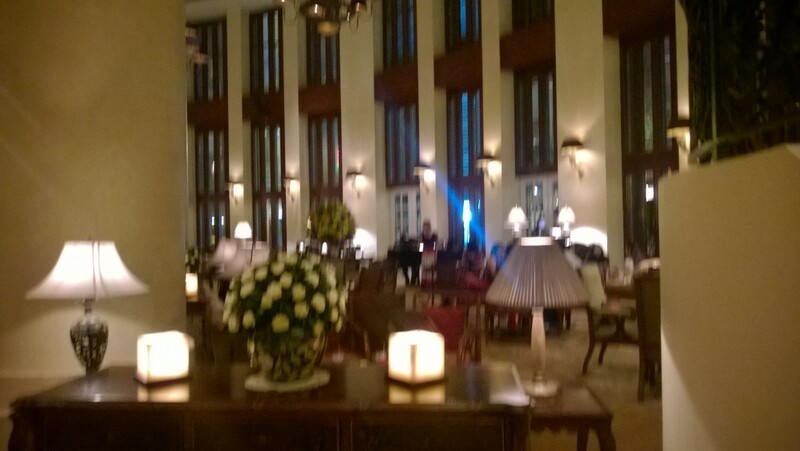 But on to a happier review-The Park Hyatt in Saigon is THE place to stay. First and foremost, the service was ridiculous from the multiple smiling faces to open the large doors at the entrance to the desk clerk to the pool guy to the restaurant staff. All happy, smiling, engaging and over the top with their friendliness. All spoke great English as well which makes everything easier for us when we travel. We appreciate it, Park Hyatt! Pool was warm with cold fruit kabobs served every afternoon-delightful! Although there was construction going on at the spa next to the pool, it wasn’t too distracting as we soaked up the ambience of an urban outdoor setting with palm trees and a delightful pool-not too hot or cold and large enough to do some laps. The Park Hyatt is definitely not a kids/family hotel so it was fairly quiet as well, unlike the Grand Hyatt pool in HK that was filled with kids. The view of the street from the suite (we could now see the river) was always fascinating, though we learned to keep the windows closed because there were several birds very interested in coming in to join us in the suite. One morning we woke up to very spirited singing as the business across the street started the work day with the guys (in black pant/black tie/white shirt) and ladies in traditional green Vietnamese tunics/pants singing loudly what could have been the national song as the video playing above them on the building façade showed the Vietnam flag. They ended their chorus and filed into work at 7:30 a.m. ready to start the day fully energized. Awakened by their lovely voices, we were ready to being our day in Saigon as well! I am definitely NOT someone who enjoys going out to restaurants. Thom and I rarely go out back in Shanghai and can be very happy eating cereal for dinner. 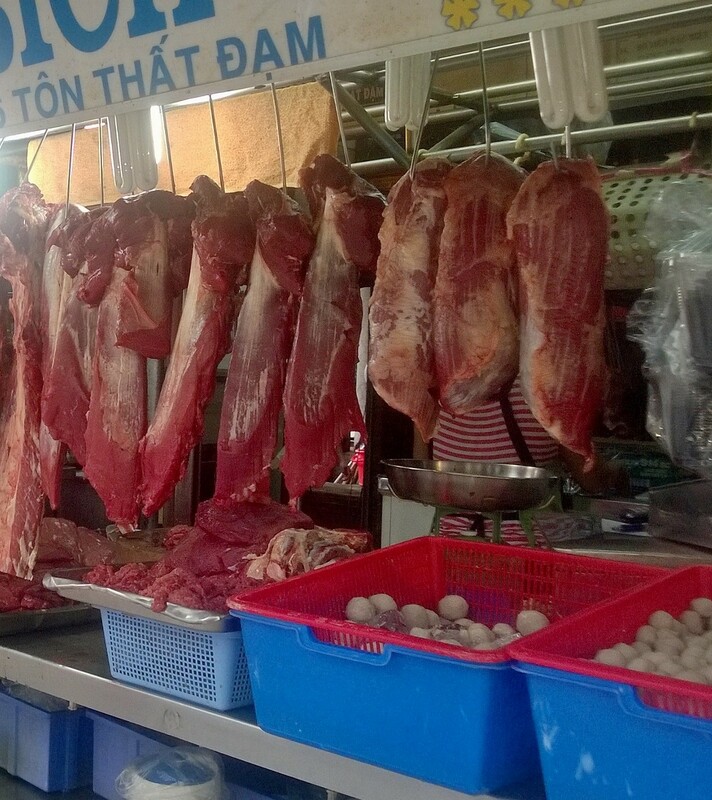 However, we enjoyed sampling the local cuisine in Saigon very much. 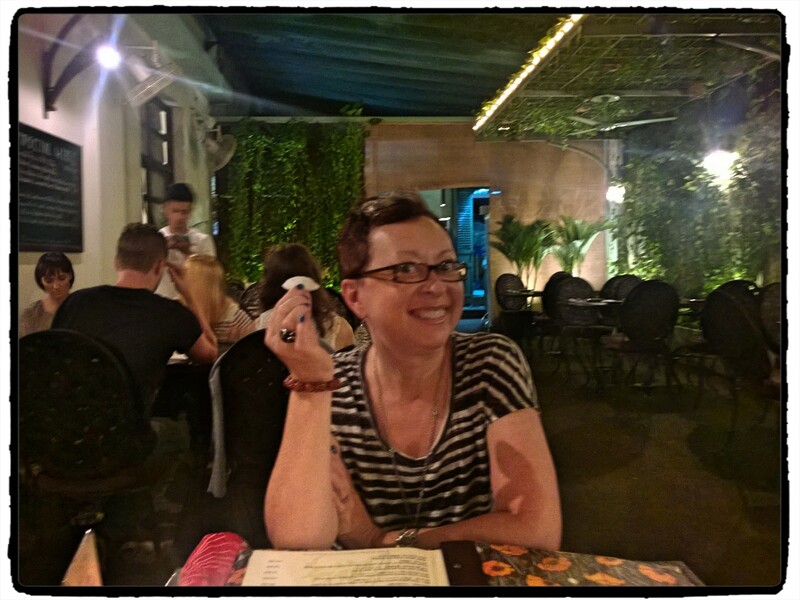 There is no lack of LOTS of amazing restaurants in Saigon so off we went to enjoy the bold flavors and diverse selection plus the price is right! A multi-course meal at a nice place will set you back $40 US or 880,000Dong and that includes the necessary wine to accompany. Cheap! 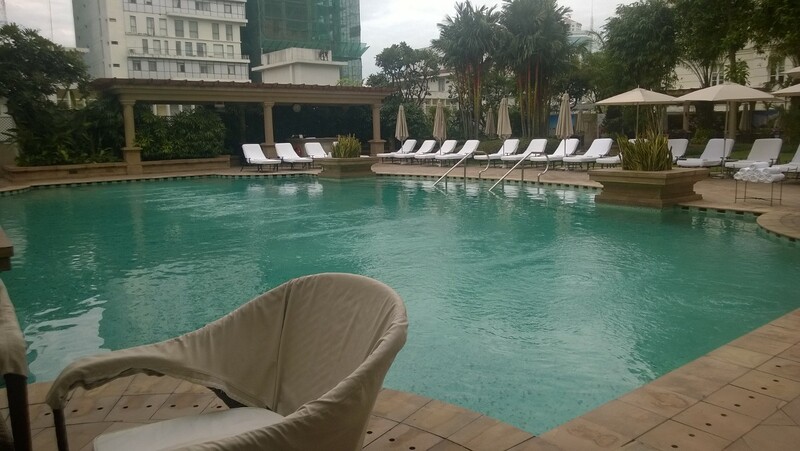 We learned quickly to plan our excursions outside to include an umbrella as every day the clouds open up in the late afternoon and it dumps lakes onto the crowded streets. Our first full day, we encountered a huge thunderstorm so we managed to just make it across the street from the hotel to at Tandoori, a Middle Eastern place. We’ve become huge curry fans so we had a bold chicken curry with cheese nan and spicy grilled shrimp with saffron rice. As we watched the scooters navigate the water outside, we dug in first to the crisp veggie samosa with pungent sauces to dip into and practically licked the plates. I would have loved to try a new dessert but no room at the inn regretfully. Not so the next night! I made sure to reserve room to try the strawberry custard while Thom took on the mango sorbet to end our evening. The Vietnamese restaurant where we went, Hoa Tuc, has a cooking school on the top floor which I read is quite good though we didn’t have time to try it out. This restaurant was tucked away with many other fine places in the Refinery, where they used to produce Opium and now just produce awesome food. For the main courses—we tried several out to sample. The coconut milk rice pancakes filled with shrimp and rolled in lettuce leaves, dipped in sauces and eaten with our hands was messily amazing. Are your mouths watering yet??? 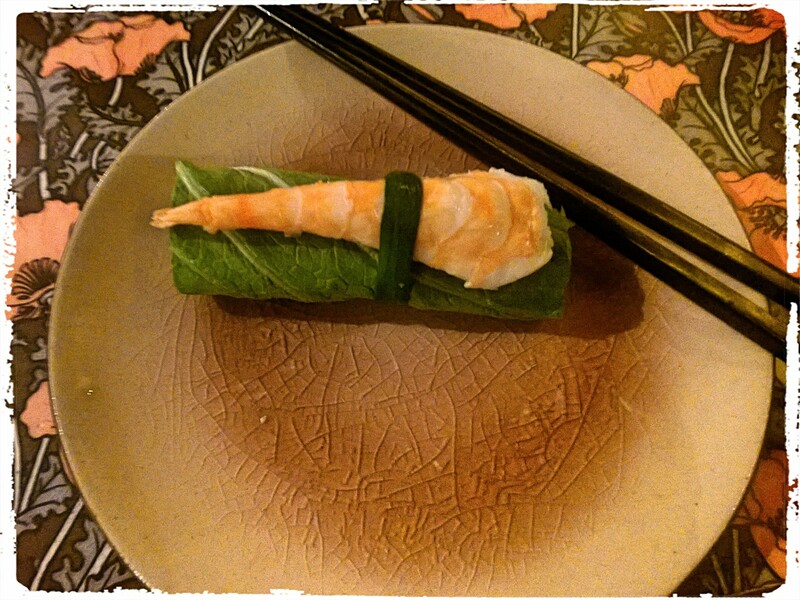 Then, the mustard leaves rolled with crunchy vegetables inside and a prawn secured on top were next. They disappeared fast. Thom tucked away his barbeque chicken pieces and I had Vietnamese brown rice with green onions and shrimp. I have never had such wonderful rice—it was dark brown, nutty tasting and so moist,having been cooked in a clay pot. I ate every grain. I could eat a bowl of that every day and be very happy and full. Our last night in Saigon, we tried to get the energy to go out and try another new place but we had been upgraded to a huge suite at the Park Hyatt so we opted for a quiet room service dinner to enjoy our luxurious digs. The food was adequate but sitting in our living room in our robes while we ate was priceless. 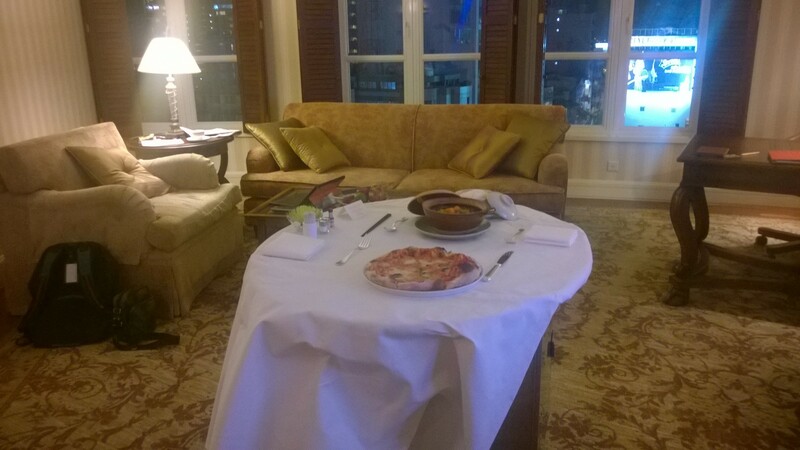 Room Service after a long day spent walking Saigon Streets=PRICELESS! We went to Hanoi earlier in the year over Chinese New Year and did the city scene and a cruise on Halong Bay. Now, we are checking out Saigon on a long Chinese Mid-Autumn Festival weekend. Not only is it extremely inexpensive by most standards for hotel, food, etc. but very easy for English speakers. We love it! 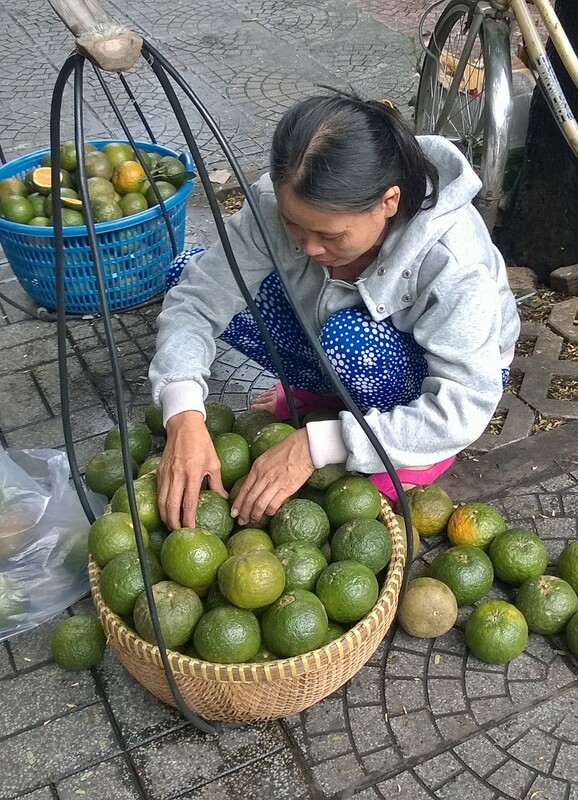 We enjoy getting lost and exploring the culture in Saigon. Around every corner, you never know what to expect so we try to just wander a new street every time we go out. 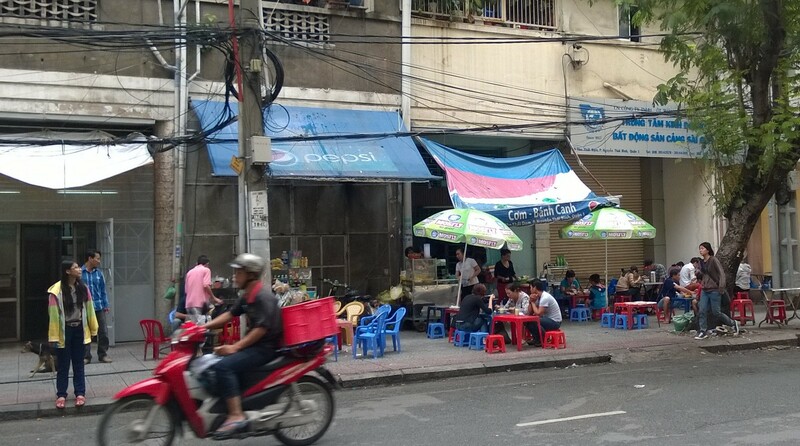 This morning we saw people squatting on their little plastic stools that are everywhere here on the sidewalks around teeny tiny tables, enjoying their Pho for breakfast. 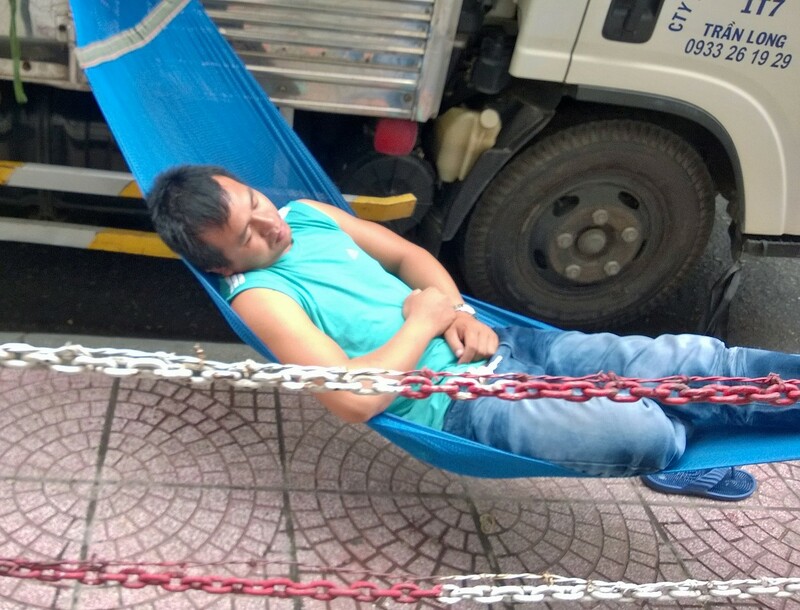 Everything is done on the sidewalks here-eating, shopping, sleeping, gambling–you name it. The apartments are probably very small and without full kitchens so most meals are eaten with friends and family at these sidewalk kitchens. Fruit is sold everywhere with the favored form of transportation big baskets balanced with a pole over the shoulders of sturdy women working hard to sell peaches, oranges, coconuts, etc. I saw one woman today cooking waffles on a small burner on one side of her basket with the finished product in the basket on the other side of the pole. Crazy! 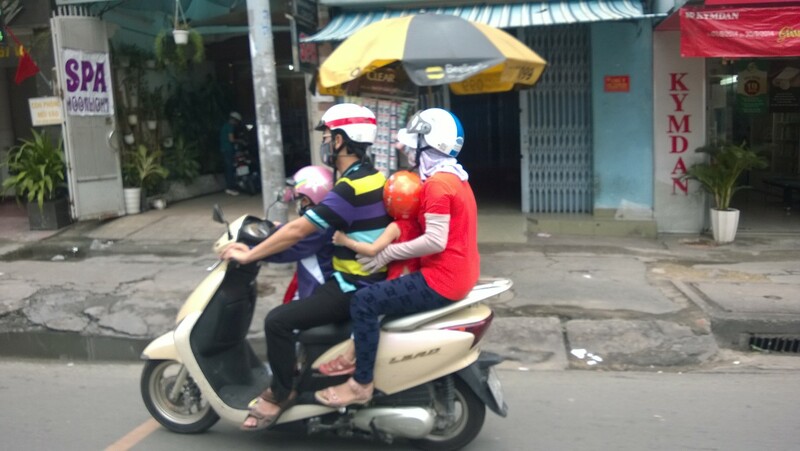 While Thom takes much better pictures than me with his super cool camera, I have enjoyed capturing the uniquely Vietnam street scenes with my Nokia phone camera which shoots great pics and videos. As the rain once again pours down in the afternoon, a daily occurrence, Thom and I are listening to top 40 hits at the Coffee Bean and enjoying our coffees while we wait out the rain. Coffee shops are EVERYWHERE. While Starbucks doesn’t dominate on every street corner, there are Costa, Coffee Bean, etc. as well as the local Vietnam chains. For a tropical climate, the coffee culture is strong here. I’m guessing the balance of sales is heavy on iced coffee products but it also looks like espresso is huge. Sitting here enjoying our Americano, we could be in NYC or Seattle but the minutes we step outside and are assaulted with the scooter traffic and people living their lives on the sidewalks, we know we are in Asia. “Stop asking people with machine guns if you can take their picture. That’s just stupid.”. After Thom tried to rationalize his behavior while sharing our adventures in Saigon with our son James, he was having none of it and proceeded to lecture his dad sternly via Skype. Someone’s got to be the adult and that is obviously James not Thom. So, lots of people ask what our kids think about us living in China and having crazy adventures. When it first came up, my daughter was none too thrilled about China preferring I get a spot in London or anywhere else where she might want to visit. That wasn’t an option so China it was and she was very supportive though will probably never visit while we are here as she is very busy with being a wife and new Mom to Mia. We miss her terribly. James is still in college so he has more flexibility to visit us on school breaks and was receptive to spending time in China. So he has been able to spend months with us in China over the school holidays and explore with us, though he doesn’t find randomly walking the streets to be much fun like we do. He likes to travel with a purpose and preferably in cooler weather like Seattle where he goes to school and always plans his days with food in mind. Boy, do 21 year old boys like to eat–all the time! 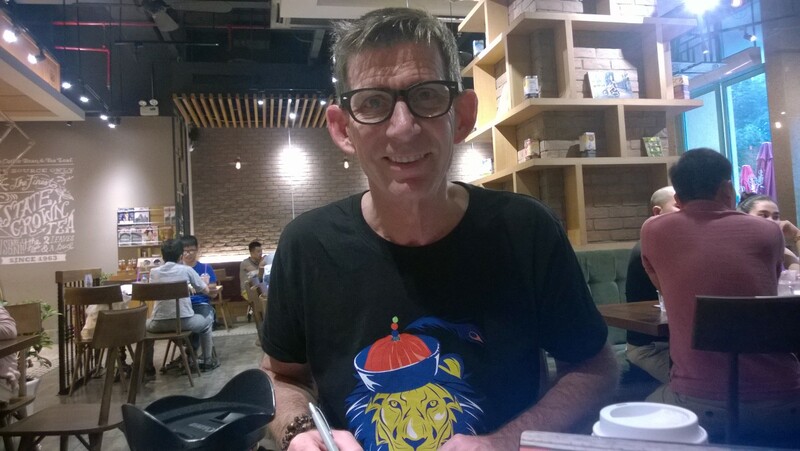 His favorite activities with us were tobogganing down the Great Wall, sea kayaking in Hong Kong but mostly eating chicken pot pies delivered to our door in Shanghai by an expat online Pie Shop. James declared them DELICIOUS-high praise indeed though I strongly believe there is no such thing as bad pie (or wine for that matter) but I’m not so picky. 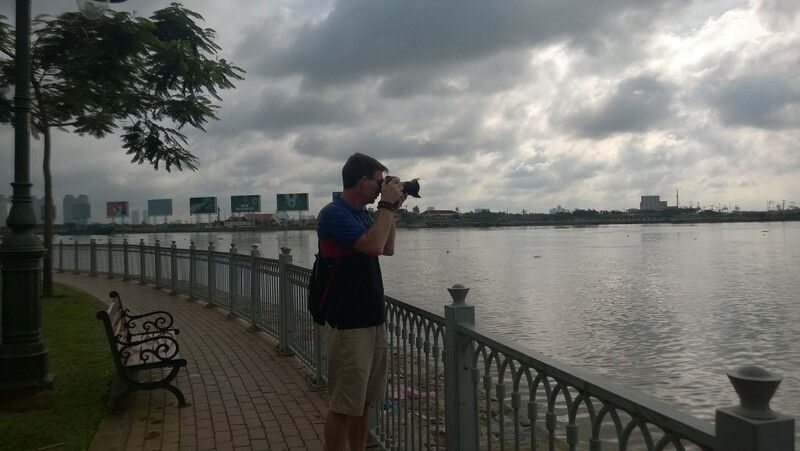 Today, as we shared our fun times in Vietnam, James scolded Thom for his risk taking. “You could get killed or arrested. Stop it!”. Like Thom will stop behaving badly-NOT! In the never ending pursuit of cool photos, Thom had seen a building in Saigon and wanted to take a picture of it. Of course, seeing the armed military guard caressing an Uzi machine gun didn’t stop him even after the guard pursued him and told him, “No pictures.”. Most rational people would apologize quickly and walk away even faster. But, nooooooo, not Thom-he smiled and asked the guard if he could take HIS picture and asked about the building’s purpose. It was a government Finance Building and, no, the guard didn’t want his picture taken. You think he wants to end up on Facebook or Twitter?? Hell No!!! Of course, Thom got his shot and it will soon be all over social media. Oops! 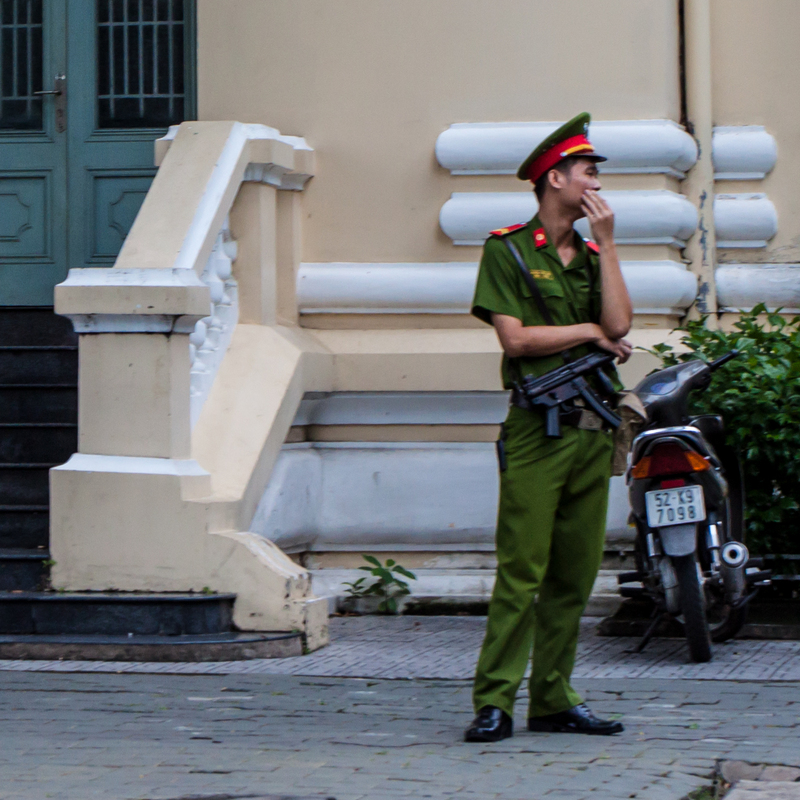 They do like to protect their government buildings in Saigon. We ended up behind a chain link rope around one building somehow and when we needed to exit to cross the street, unfortunately we found ourselves having to jump over the chain but now it had barbed wire wound through it. Now, I’m in a skirt and trying not to impale myself on this as I slowly executed a maneuver to get over it. Yikes! I think I flashed the traffic passing by but a girl’s got to do what a girl’s got to do to keep on having adventures. This is also why we now carry a first aid kid with us at all times. Be prepared is our motto-the worst can and will happen in a foreign country, which makes for good memories and interesting stories to share. Back to Shanghai tomorrow! 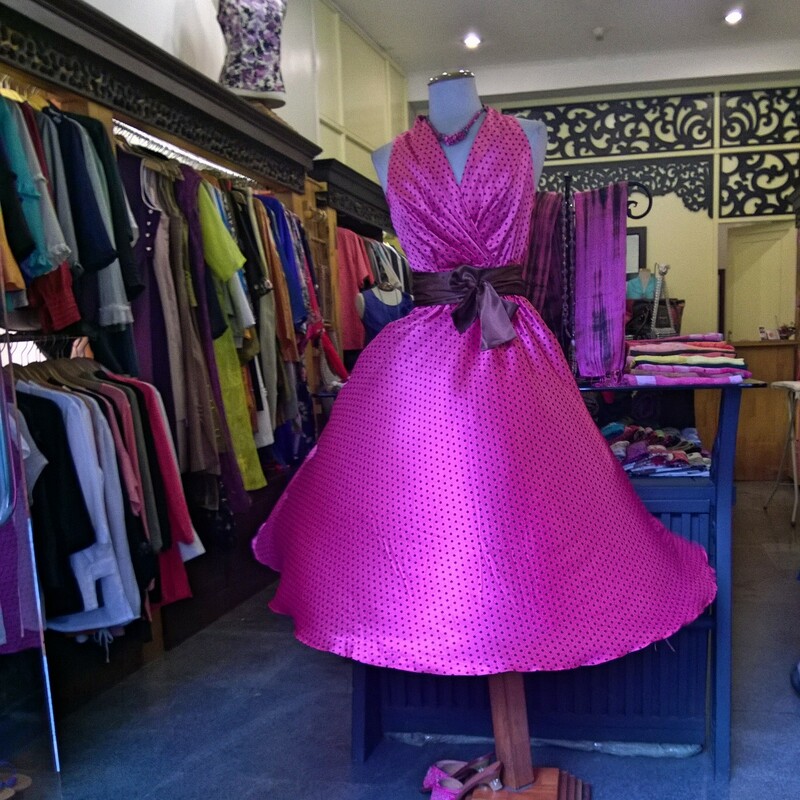 When you peel back the layers of fashion in Vietnam, you discover that besides the Vietnam traditional outfit for ladies which consists of a flowing tunic with pants, the fashion here varies widely with trendy boutiques offering truly fashion forward choices for shoppers in Saigon. Of course, you’ll pay to be unique so you better load up at the ATM with millions of Dong ’cause you are going to need it to take home one of these outfits. Hot Damn, let’s do some shopping!!! Not only are the stores decorated with trendy touches from statement art to industrial chic with stained concrete floors, steel lighting plus the visual displays make you want to touch and buy their products. One chic store had everything from b/w Vietnam portraits screenprinted on iPad covers to brightly colored recycled vinyl bags and sandals to handmade necklaces. Hold me back–my luggage is already too heavy! Lured in by the outfits in the window featuring men’s pants with a studded fly (for dudes who want some attention I’m guessing), this gallery of fashion finds featured garments that were works of arts accented by the dragonfly wire hangers they were hung from. Very expensive and probably too nice to actually wear in my lifestyle, I admired the artist’s embroidered shirts and wraps as well as her one of a kind necklaces. Thom shot off some photos for me while I tried to distract the shop girls because I knew they wouldn’t allow it–sure enough, they shut him down quickly but not before I got a few to share. 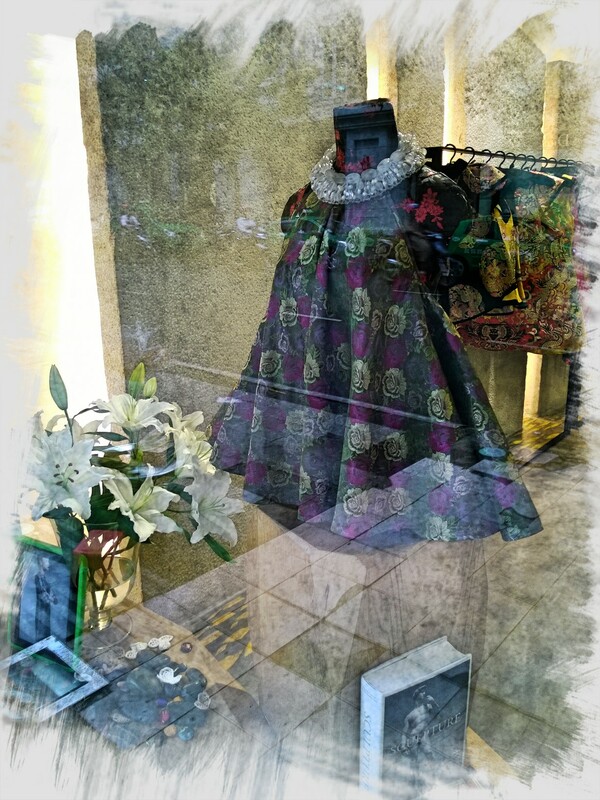 At yet another gorgeous showroom, the beautiful silk prints in heavy brocade fabrics draped just right were set off with huge statement necklaces. I wouldn’t dare buy silk because I would almost surely dribble coffee on it or, God forbid, sweat while wearing it. 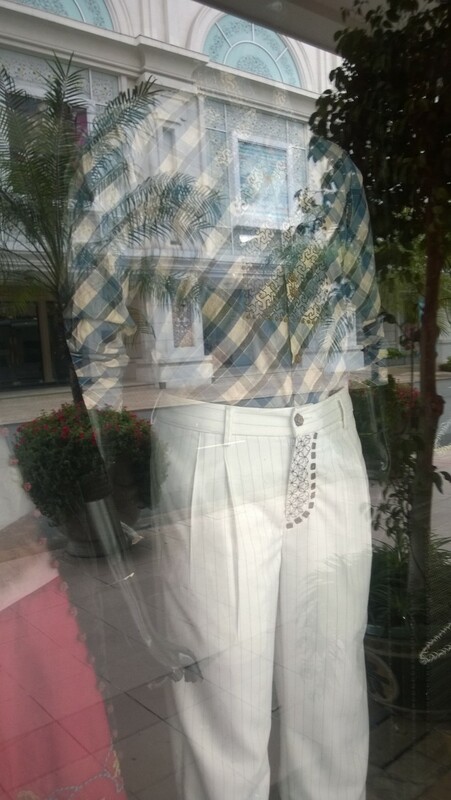 Still, I appreciate the gorgeous styles that are too expensive for most folks here in Vietnam. I was surprised to see as many luxury retailers here with the large showpiece stores-LV, Chanel, Hermes, etc. all are represented here in Saigon by our hotel. 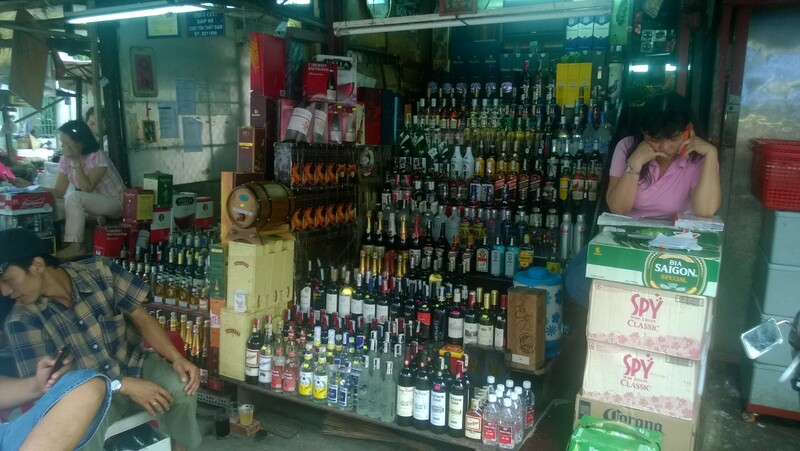 Our last day is today so I’m off to pick up a few more items to remember our great stay in Saigon. As the navigator in charge of map duties today, I promptly got us lost on our first full day in Saigon. Lucky us, we managed to stumble into a cool art gallery open house complete with artists giving interviews and free wine. SCORE! 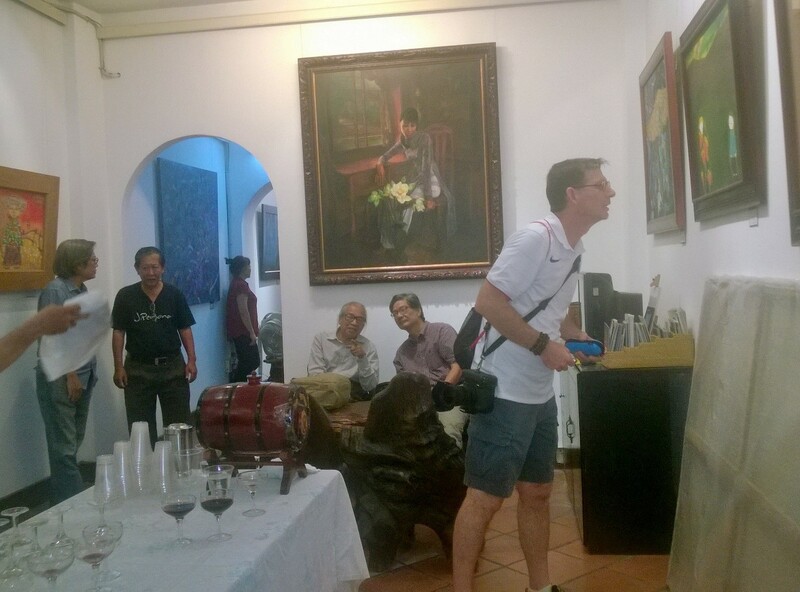 The paintings were very diverse from the Vietnam water buffalo to striking portraits and colorful murals. 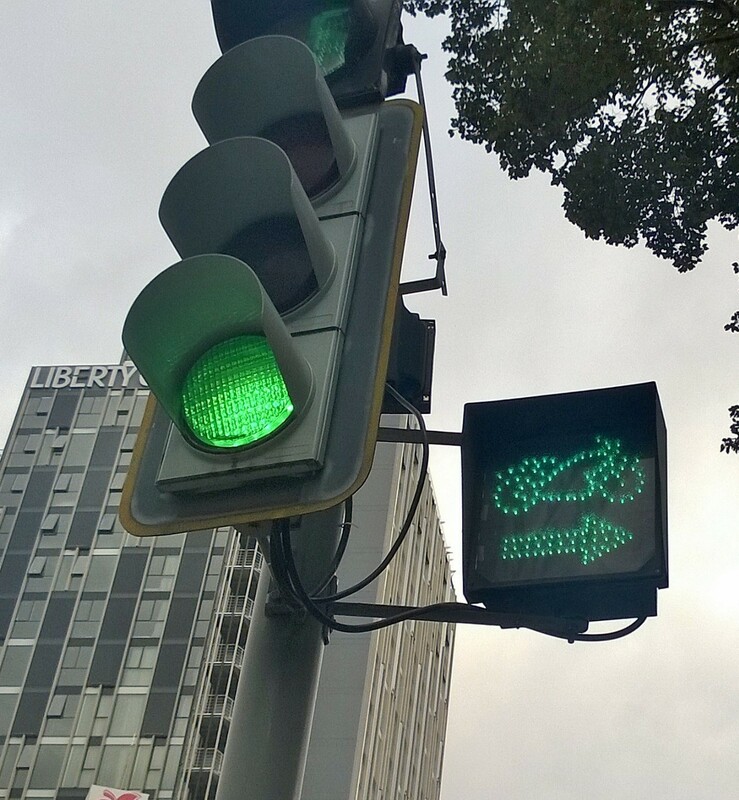 I love these type of unexpected surprises when out travelling in new cities. While we were the only expats in the place, everyone just smiled at us and let us admire the art at our leisure. Rounding a corner where one store had 12 feet of nothing but mooncakes for sale, we found a local market where Saturday shopping was in full swing. This wasn’t the tourist t-shirt market. The stalls sold veggies, fruits-lots of coconuts ready to be capped and a straw inserted to drink the water-as well as very unrefrigerated meat just hanging out with the flies. YUM! Maybe there was so much hard liquor for sale as well to chase down and kill all the germs from eating the street meet. My Gma Hannah believed in the medicinal properties of Jack Daniels–one shot is a cure for what ails you. Quick and effective home remedy! At the market, you could stock up on most of the basic needs–a fan, socks, undies and most grocery items with lots of USA branded snacks available as well. 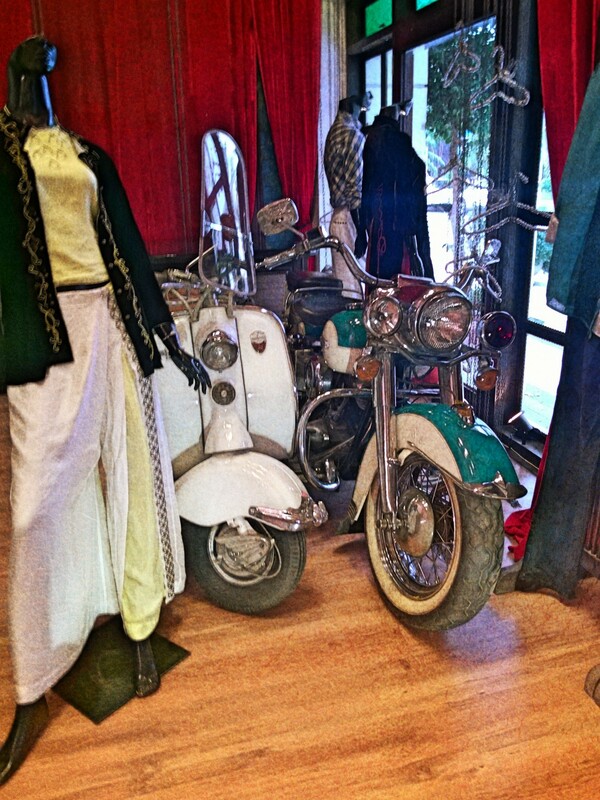 The scooters, of course, kept us on our toes as we took photos and browsed. Though there seem to be less scooters on the sidewalks than in Shanghai, in general the scooters dominate all streets. As we crossed a busy intersection, Thom yelled, “I’m going. Follow at your own risk” BAM–He boldly stepped in front of and between the barrage of traffic to get to the other side. He is fearless and perhaps a wee bit stupid as well, all good traits to have to navigate here. A couple beside me laughed and I commented that Thom was from NYC and could navigate almost any busy street without dying. Turns out, the Australian couple I talked to were going to Shanghai next so we traded China best practices (don’t buy street or PC Mall electronics, buy pearls from Sarah’s Pearls at AP Market) and they encouraged us to see Melbourne soon. Australians are such friendly mates! I can’t wait to check out their country. As we found our way back to the hotel for pool time, we realized that the shop we had gotten lost looking for was very close by but, had we not got lost, we would have had a very dull morning. Getting lost is our way of soaking in the local culture and discovering new and exciting places. May we always enjoy the journey and, with me navigating our adventures, we will surely always get lost along the way.